An aerial placed outdoor and powered through your transceiver constitutes a conductive electrical circuit offering very few resistivity. This is of course very fine to work on the air in good conditions but this property has only one drawback. That means that during thundery weather an antenna conducts very well electricity and if you do not take care, a lightning striking its structure can very rapidly reach and damage all your hamshack if it is not properly protected against lightnings and grounded. In the same way, if you try to touch the ends of an antenna or the rungs of a tower during a thunderstorm, you can endure huge discharges of static and be injuried at the 1st degree if not worse. At last during these events if the tower or the antenna elements are too close of a metallic object, including distribution power lines, you can damage these materials due to arc and other sparks. These very dangerous phenomena mainly concern metallic towers, beams, verticals and very long dipoles, as you have few chance to be concerned if you work with an indoor antenna or if you use a wire antenna shorter than about 10 m. But do never provoque Murphy ! We cannot conceal the fact that a good lightning protection cost a few money, and even much if you desire to protect a large installation. Best to know it... A dozen PolyPhaser surge protectors cost $500, as much copper ground rods cost $100, some clamps and other angle adaptor kits cost about $100, the copper straps can largely exceed $500. You have to add tools and maybe some technical books. Hopefully for a small amateur radio station like mine the investment is still tolerable. But when the total cost exceeds $3000 most of us think about it at twice before investing. But you must compare the price to pay for an efficient lightning protection to the price of potential reparings and administrative annoyance. Here are real-life examples. Encircled, is the last trace of damage that we can still see in W0ZUX, Andy Flowers' hamshack after the visit of dame Nature and Jupiter ! Andy Flowers, W0ZUX, exprimented a direct strike on his house and show us his shack at left. He accepted to explain to us what happened when the lightning stroke. Here are his comments. "I had a surge surpressor on one of the AC outlets, and it was not damaged. The other outlets were destroyed. But I had no surge protectors on the antenna wires. My 2-meter transceiver directly in front of the main outlet was damaged beyond repair. 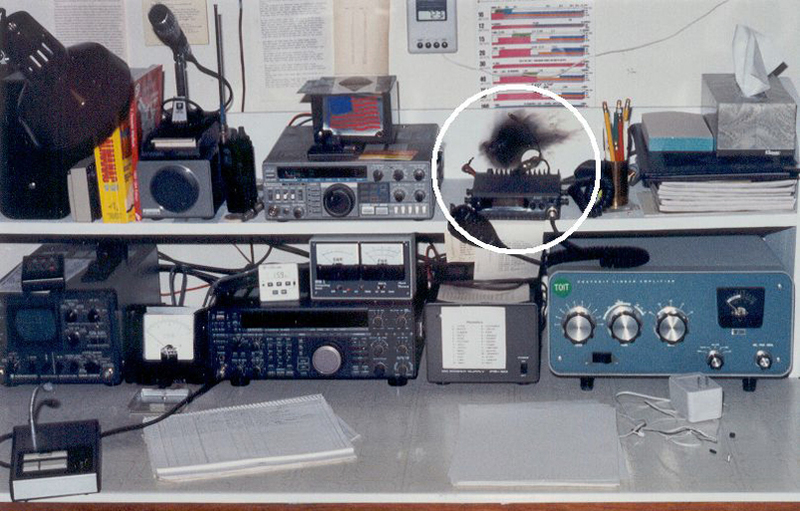 On the desk, below and to the right, is a Heathkit SB-200 linear that was not damaged. Next to the linear is a Kenwood PS-30 power supply. It was damaged and had to have several parts, including the on-off switch replaced. To its left is a Kenwood TS-850S transceiver. It had some damage and was repaired. More to left is a CDR antenna rotator control box. This had exploded and the case was nearly destroyed as were many of its parts". To continue, "Nothing else on the desk was damaged. At the time lightning struck, I had two computers turned on and both of them had to be repaired. One coaxial cable end was on the floor and it burned a hole in the carpet about a foot in diameter. The noise and light in this flash were horrible ! The room was filled with smoke and the lights were out as the circuit breakers to this room had tripped. There was some other damage in other parts of the house also. The total damage was about $3000 that were covered by my insurance, but $200". Hopefully for Andy his insurance agent paid the replacement value, or actual repair cost, without taking into account the depreciation. On his side, Harry Bloomfield's hamshack, M1BYT, was stroke by an indirect strike : "A few years ago, the steeple of our local church was hit by a massive direct strike at about 2 am when I was fast asleep. The church is about 100 m from my home, but the noise was unbelievable and I must have caused me to almost jump out of bed. I remember landing back down on the bed. The strike was so intense it had travelled down the lightning conductor, through the walls and caused a large area of plaster to fall. The church repairs took 6 months. Many phone lines were damaged within a 1 km area and it took BT a week to reinstate many of them. None of my equipment was turned on, but the pulse wrecked my internal modem, travelled through my PC, out the parallel port, then wrecked the port IC on my laser printer. I have a steerable dish satellite system which was turned on and the pulse took out the front end of the receiver, but it did not damage the LNB. I had a range of receivers and tranceivers (HF and VHF), most were connected to antennas, but all of these surprisingly escaped any damage". Thus in this case, without be protected, Harry's equipement was partly damaged although it was switched off but not disconnected from the line. After have lost, or almost, so much money and lost many time in administrative tasks, investing the same amount in a good lightning protector looks "more normal" and certainly justified. If I remember well my meteorology studies at the Air force, in average there are 20 millions thunderstorms on the earth during one year, so in average 55,000 thunderstorms each day ! We mean by thunderstorm, the recording of at least one clap of the thunder (corresponding in the SYNOP weather code to group 7, WW=17). Taking into account the duration of a thunderstorm (a few hours) we can say that some 2600 thunderstorms rage on earth at each instant. 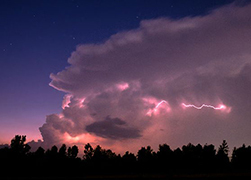 In general, the frequency of thunderstorms increases from the poles to the equator due to a progressive increasing of the period of sunshine and moisture. In tempered european countries or in the northeastern coast of the U.S.A. including New York, there are 4 to 7 thunderstorm days per year at spring, 9 to 14 in summer, 2 to 5 in autumn and only one or none in winter. Reported on the year we observe 18 thunderstorm days per year on the seaside and 25 at a distance of about 300 km inlands. For your information, the California coast records the less thundery events compared to all other states, with a maximum of 5 thunderstorm days per year, when the central Florida supports up to 90 thunderstorm days each year ! Without taking into account the influence of the latitude and moisture, being given the higher instability of the atmosphere over lands in summer, the frequency of thunderstorms is usually higher than over the ocean. At the seaside, thunderstorms mainly occur at night. Crawlers, leader channels and CG lightnings are three common appearances of lightnings. Documents Chris VenHaus, WPOD and Fiche W.L. Driven up by the convective movements caused by a strong instability of the air, quite rapidely friction occurs inside a thunderstorm cloud between droplets or ice particles. These sheerings and collisions lead to charge the cloud of static electricity, the negatives values gathering at the lowest level as the ground is charged positively, while positive particles gather on top of the cloud, near the famous anvil. When the static charge reaches a threshold, a leader channel is created between the cloud base, searching to reach the ground, and its counterpart in the ground, from which ions escape, searching the negative particles in the cloud base. This channel contains ionized atoms, ions and free electrons; this is a conductive plasma. When both channels encounter at mid height, a huge discharge occurs in a few microseconds (typical 1.8 ms). When the connection is established, the leader channel free its energy, reaching temperatures exceeding 50,000° during one microsecond, compressing highly the surrounding air. This phenomenon creates a huge explosion developping a shock wave that propagates a few kilometers away. Now that a channel is created between the cloud and the ground, a discharge can occur. These discharges can burst out either between the cloud and the ground as in our example (CG lightning) or between the different parts of a same cloud (CC lightning ou Crawler), or at last between different clouds constituting a supercell. When the channel is triggered off, the lightning strikes the ground following the path of least resistivity, hence its path in zigzag. 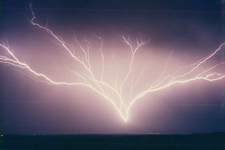 In the case of a CG lightning, only the first return lightning displays a tree structure while the successive discharges will always use the same channel, giving to the lightning the impression of flashing like in the film displayed at left. We can record up to 30 return discharges coming from the ground in a period of one to two seconds, giving the feeling that the lightning is persistant and very bright. 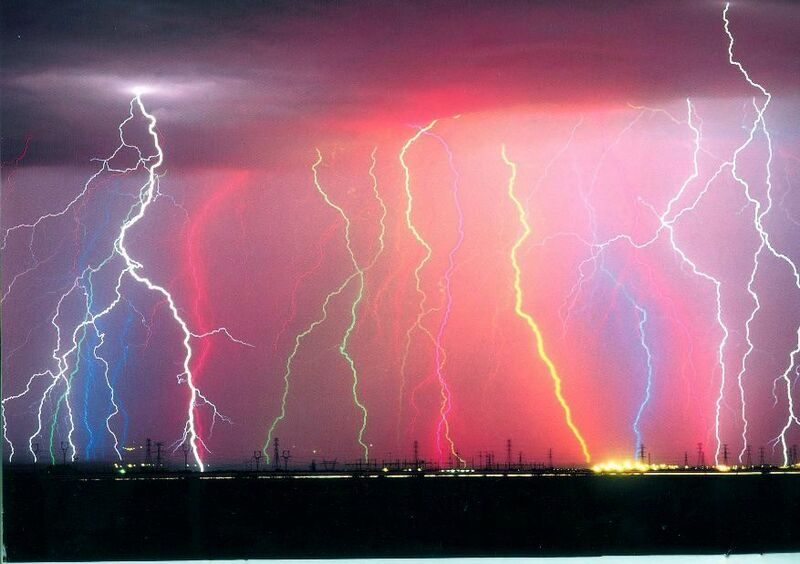 When the lightning stroke, the cloud reload itself a few times depending its maturity and its activity. Some thunderstorms cells can generate more than 100 lightnings per minute while the less active emit only one lightning during all their life cycle, so in a period of one hour. These lightnings find their origin in the high value of the local electrical field that can reach a potential exceeding some thousands volts per centimeter just before the discharge ! Discharge currents display a peak energy ranging between 18 and 31 kA including short variations up to 24 kA/ms. But they can also reach more than 200 kA during a few microseconds ! The conductor (a wire or a tower) is subject to huge voltage too that can reach 750,000 V ! Induction generated in electrical circuits of a house can generate voltages exceeding 100,000 V ! A tower or any elevated structure is also a huge generator of voltage. The potential difference between the top and the base of a 10m high (33 ft) tower is about 30,000 V during a thundery weather. If this energy is not dispersed away, the least object showing the lowest impedance will be seen as a perfect sink. If you are just in contact with your equipment in such a circumstance, you will endure a severe strike although all is well grounded, excepting you. It is better to know instead of be surprised ! These low frequencies radiations can be picked-up by a small LF antenna and directed to a computer that will analyze the signal intensity and it is distance. Some manufacturer like Boltek provide a "lightning detection tracker" (using a PCI card or the serial port of your PC completed with a software) that warns you when the energy reaches a threshold. 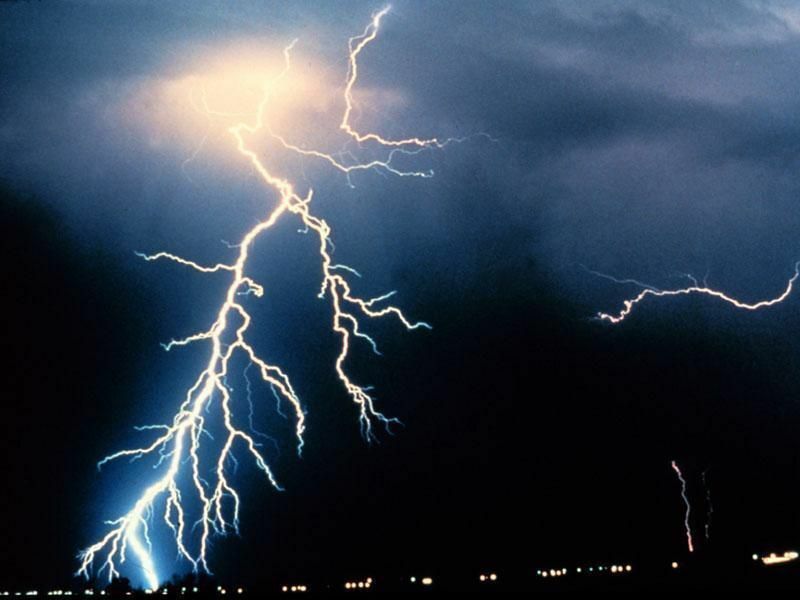 If we are able to see and hear these lightnings, due to their extremely high currents and voltages, there is no doubt that they also produce undesired effects on equipements powered on the main that is a great friend of dame Nature and Jupiter, famous for holding the lightnings in his hands. I have thus only one recommendation to suggest you : protect you against their angry ! ...all the electrical head exploded : all 64 amps fuses, the meter, the circuit breaker, the relay, including the TV, the video recorder, the digital phone, the computer screen and its video board, the modem, and last but not least, the computer motherboard burnt, although all these devices where switched off and linked to a lightning conductor that exploded too ! The VHF RTX that was switched off was stroke also and the fuse equipping the HF RTX blew out. Its 30 Ah power supply was hit and the switch on/off button was inop. At last the motherboard of the small rotator AR-40 burnt also but as strange as it is all antennas were preserved and continue working like usual ! The sole common point between all these devices is that all them were linked to the same ground. In other words, the lightning went up by the ground ! So the lesson is next : never say that a good ground can preserve you from a direct strike. In such circumstances this accident confirms that a difference of potential can always exist between two grounded objects and damage your hamshack. Your only safe protection 100% sure is to unplug all your electrical devices from the power line, switch off your devices, and get a good insurance... Hope this helps ! How to protect your assets ? We must make a difference between the electrical protection provided by your house electrical circuit and a radioelectrical protection suited to HF needs of an amateur radio station. But in all cases, as you will probably be connected to the main, that you will maybe install some domestic gears, a telephone, additional lights, and why not a TV in your shack, the lightning protection will have to protect all these equipements too and not only your transceiver and your antenna system. In this article we will not review the domestic protection consisting for example in installing lightning conductors on the high points, breakers in the electric distribution panel, etc. This subjet requests however a specific study. 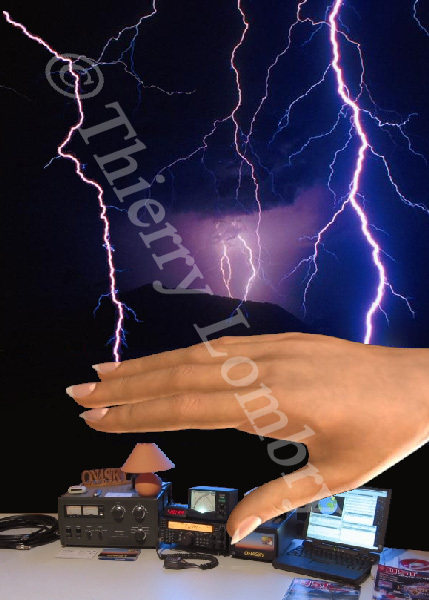 In theory, a good lightning protection must protect all your radioelectrical equipment, for short all your hamshack. A similar but independent protection should of course cover all your domestic devices (frige, cooker, microwave oven, TV, VCR, DVD, portable radio, Hi-Fi, computing network, answering machine, lighting, etc), both being interconnected on a perimeter ground surrounding your house via the utility entrance. In addition, in large stations you willl probably have to take in consideration the fact that the shack is maybe distributed across several rooms and thus that you will have to install multi interconnect copper strap buses to ground all these gears; the concrete floor conductivity impacts also the location of the SPGP; and at last the constraints of your environment do not always allow you to run the wires or the copper strap to the ground as you want in terms of accessibility, length or esthetic. Let's review now each step individually, it is not so difficult. An electromagnetic or E-bomb works the same way as a lightning but its effects extend over a larger scale. An E-bomb is neither a nuclear weapon nor a lethal weapon. It is a tactical weapon generating either a powerful electromagnetic field at ultra wide band (UWB) or an high microwave pulse (HMP). When an E-bomb explodes, in a fraction of a second, the energy released transforms the air in a plasma by Compton effect (electrons are temporary ejected from atoms in a chain reaction) and becomes conductive of electrical signals. An energy of about 1011 J (~1 kT) spreads in a spectrum as wide as 100 MHz. Close to the ground, the electrical field reaches 20 to 50 kV per meter, a potential difference of 500 V per centimeter ! The intense EMP spreads at the light speed in all the area, damaging all electrical components, even those hid in unshielded shelters against EMP (e.g. using Faraday cages or cabling systems made of optic fibers) or those so called protected by the meanderings of a sinuous corridor; the EMP laughts at all these protections or obstacles. When such a bomb explodes at 500 km of altitude, its effects are optimized and extend in a radius of 2500 km; all a continent experiments a power failure and most electrical equipments (home devices, computers, radio, TV, GSM, life support, etc) are damaged. The power of an E-bomb is usually equivalent to some tens of kT of TNT and such a weapon can easily be placed in a Lance Missile (0.6 to 1.6 kT). This technology was successfully tested in secret by U.S.A., Russia, France and Germany. Militaries call this a "clean" bomb as it doesn't release radioactivity and shouldn't wound living beings.